Spirit touches us in every moment of our existence; only most of us are caught up in the dramas that we have created in our lives, blinding us to a reality far greater than anything we can imagine with our rational minds. It is simply a matter of awareness. Though we often feel lost and abandoned in a cold and uncaring world, the truth is that we live in the illusion of our own self-created exile, away from the Source of our being which has never stopped loving us -- unconditionally. The time has come to awaken and pass through the darkness of our fear induced slumber to embrace the light of truth, and find our way back to the infinite light of love that comes to us from the Source of all creation. Awareness is presence, which means being fully present, in the present, right here, right now, in this moment, standing in the light of truth, which is the greatest present anyone can receive. 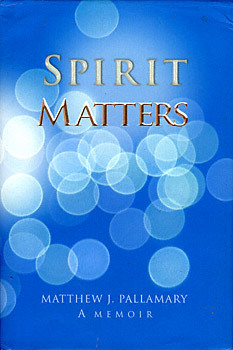 Matthew Pallamary's SPIRIT MATTERS chronicles his life long search for truth, which took him from the false spirituality of a violent concrete jungle in an Irish Catholic ghetto in Boston, to the discovery of true spirituality in the jungles of the Amazon where he discovered the truth.